Utah bus riders face reduction and elimination of weekend routes. Want to be a real ‘‘nowhere man?’’ Try being carless in Salt Lake City on weekends, beginning April 4. Reduced sales-tax revenues are forcing the Utah Transit Authority to consider eliminating or reducing Saturday service on a number of routes—including routes 9, 11 and 17. This is on top of UTA already eliminating late-night TRAX service on Friday and Saturday nights. Lupita Blower rides the Route 9 bus most Saturdays from her home near State Street and 900 South to the 9th & 9th neighborhood where she buys groceries and visits a salon. Her health problems prevent her from walking very far, and she cannot afford the costs of owning a car. However, if Saturday service on Route 9—which travels primarily along 900 South between the University of Utah and the Ballpark TRAX station on 1300 South—is canceled, Blower would either need to take a bus requiring multiple transfers or be forced to pay for a ride. “It’ll be difficult,’’ the 50-something Latina says. ‘‘My only option is to pay for a cab—that’s $14 round-trip. That’s a lot of money for me.’’ UTA defends the cutbacks, saying they’re based on usage, with the off-peak, low-ridership routes being targeted. For the city’s low-income residents, however, such cutbacks can wreak havoc. Laura Summers, research analyst for the Utah Foundation, says busschedule changes can cause ripple effects in riders’ lives, including reducing the time riders can spend with family, as well as increasing transportation and child-care costs. “Cutting service affects their ability to get to work and increases time spent traveling,” Summers says. UTA decided to cut back on latenight TRAX service because weekend ridership drops significantly after 11 p.m. The light-rail routes average 1,000 riders between 10 p.m. and 11 p.m. on Friday but average only 411 between 11 p.m. and midnight. Currently, the last Sandy-bound train leaves the downtown Intermodal Hub at 11:01 p.m. on Friday and 11:14 p.m. on Saturday. The last Murray-bound train leaves at 11:46 p.m. on Friday and 11:54 p.m. on Saturday. The last eastbound University service leaves the Intermodal Hub at 11:11 p.m. on Friday and 11:24 p.m. on Saturday. Brown says that the cutback may be seen as a way to curb late-night drinking, but if that is the motivation, it won’t be effective. Instead, he predicts, bar patrons will simply continue to drink, but they will be driving instead of riding mass transit. Bar patrons aren’t the only segment affected by TRAX service cutbacks, says Jason Mathis, executive director of the Downtown Alliance. A vibrant downtown doesn’t only involve bars, although they are a significant piece to making a downtown dynamic. Jazz basketball or Capitol Theatre patrons might want to remain downtown to dine out after a game or show, but the TRAX schedule forces them to leave earlier than they might have otherwise. What's in the Future for Utah Public Transportation? Mathis says he has met with UTA and they are open to alternatives. “One option I suggested was that there be one last train that leaves [Sandybound] when bars are closing down, thus still providing a valuable service,” Mathis says. Minimizing service comes down to cost savings. “We don’t have the revenue to run the same service we have in the past,” says UTA spokesman Gerry Carpenter. A majority of UTA funding comes from local sales-tax revenue, which is down $38 million from projections two years ago. Cutting light-rail service and other adjustments trims $500,000 in expenses, which will save jobs, unlike other transit systems that are laying off workers. Carpenter can’t say, however, if or when service will be reinstated. Salt Lake City Councilman and urban planner Soren Simonsen says UTA does an admirable job of leveraging federal dollars, and it does well in terms of service. However, it could be more efficient in enforcing ticket usage and implementing pricing that encourages more people to use mass transit for short trips. “I have been frustrated that we don’t use a distance-based fare system,” Simonsen says. 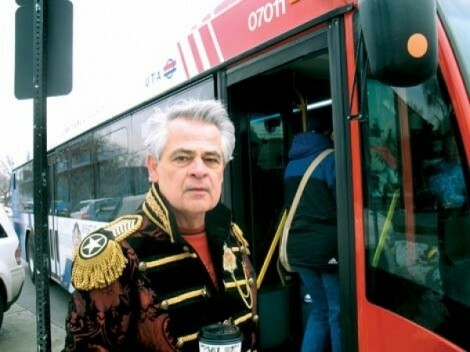 To ride a bus a few blocks costs the same as riding TRAX from Sandy to Salt Lake City. He believes that people should pay more to ride TRAX than on the bus, factoring convenience and speed into cost. This could increase bus ridership, especially for those traveling short distances. Simonsen says that he has seen the ebb and flow of UTA service in the past, and he thinks this adjustment will be short-lived. Other ways to cope with budget shortfalls, such as halting construction on projects like the FrontRunner South extension into Utah County, are not viable due to their large capital investment. UTA also is looking to capture more revenue by increasing prices for the EcoPass, a company-sponsored transit pass for companies with at least 35 employees (although to qualify, a company must purchase passes for every employee). UTA is looking at a 10 percent increase on standard passes and 20 percent on premium passes. Ironically, the Utah Department of Transportation will no longer offer the EcoPass to its employees due to UTA’s increase, along with the department’s own mandated budget cuts. “This is one of the ways we found that we could [cut costs] internally, as a department,” says Adan Carrillo, UDOT spokesman. Finally, if fewer riders use mass transit because of increased costs or reduced service, it means more will be driving cars instead. And that could lead to even dirtier air along the Wasatch Front. ‘‘It’ll be harder for individuals to reduce their emissions without ready access to bus routes,” says Debbie Sigman, vice president of Utah Moms for Clean Air. People will only compromise so much for the environment. She hopes—both as a bus commuter and an environmentalist—that UTA’s modifications don’t have the unintended consequence of turning people away from using public transit. UTA has scheduled public hearings in Weber, Davis and Salt Lake counties to discuss bus rerouting and line elimination, beginning Tuesday, Jan. 19. For a complete list of proposed changes visit www.RideUTA.com.